Paper goods purchased by the group for Common House use should be made from recycled material, if possible. Plastic purchased should be re-usable, recyclable, or biodegradable, if possible. 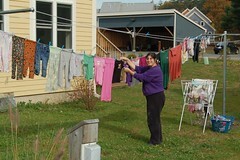 Fragrance free, eco-friendly detergent will be provided in laundry room. There will be no storage of fragranced products in laundry room. Of the three washing machines and dryers in the common house, two of each will be designated "fragrance-free" and one of each "fragrances ok". In the "fragrance-free" washers and dryers, do not use products with fragrances or any dryer sheets.